Sorry Charlie Crist, You Don’t Have Scott Rothstein to Back You Up This Time! Charlie Crist is trying to do it on his own. “On his own”, meaning he won’t have Ponzi-schemer Scott Rothstein to back him up like he did in previous elections. For those of you who don’t know, Charlie Crist was the beneficiary of major Rothstein money for previous elections. Rothstein, who is currently getting three hots and a cot in prison, has said that Charlie Crist was bought and paid for. Allegedly one of those things involved the buying of judgeships. Scott Rothstein says he had a “quid pro quo” relationship with Crist. In exchange for campaign contributions, Crist named judges to the bench in Broward County who would rule favorably for Rothstein’s law firm. Of course these are claims that Crist vehemently denies, not that anyone expects him to admit to it. Perhaps Crist isn’t worried about Rothstein’s current accommodations, and lack of support, because Crist now has John Morgan, a personal injury lawyer who is known for dropping large amounts of money for various reasons, around this state. Mainly advertising. Now if Charlie Crist were to appoint judges that are “kinder” to plaintiffs, I’m sure John Morgan would be very, very happy. I think that liaison is clearly worth watching. If Crist sold judgeships once, he will certainly do it again. A leopard NEVER changes his spots. Oh wait, this is flip-flopping Charlie Crist we are talking about, so ANYTHING goes with him, as long as he can get something out of it. 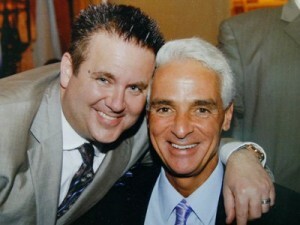 If Scott Rothstein is one of the great liars and scam artists in Florida history, he is in company with one CHARLIE CRIST!